2017 is going to be the year of 'maybe I don't need a top end device'. We've already seen so many options that buck the trend of having top end specs that still perform just fine, add in the ever rising prices of the flagships and there's going to be a big push for that middling device. Unfortunately, with some of the middle devices you don't end up getting some of the nicer features. Performance is still okay, but you miss out on battery or some key unique feature. Well, the upcoming K series of devices from LG will have some of the flagship features added in, like their wide angle front camera or the fingerprint sensor. Some nice bonuses! They'll be unveiled at CES in just a few more week. 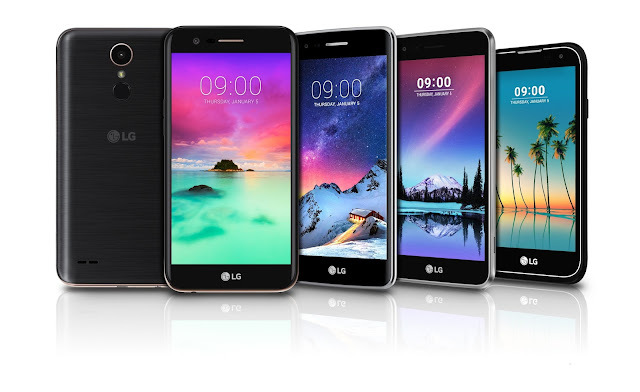 TORONTO — LG Electronics (LG) will unveil four new mass-tier K Series smartphones and a new Stylus 3 at CES® 2017 in Las Vegas, as the mid-range segment continues its strong growth as the market matures. The new mid-range devices are designed to bring popular, best-in-class technologies from LG’s more premium flagship smartphones, such as the 120-degree wide angle front camera lens and the rear fingerprint scanner. LG’s updated K Series carries over the original philosophy that all customers do not want the same things in a smartphone. Rather than offering one main smartphone model and expecting customers to adapt, the K Series was designed with the diverse needs of consumers in mind. The K10 delivers a best-in-class 5.3-inch HD In-cell Touch Display that delivers a superb viewing experience indoors or out. Its 5MP front camera with 120-degree wide angle selfie lens complements a premium, 13MP rear camera that has been employed in LG flagship G series devices. Other advanced features not usually available in smartphones in this category include a fingerprint scanner, a metallic U-frame for a sturdy but slim 7.9mm profile and 2.5D Arc Glass design. The K8 features a 5-inch HD In-cell Touch display and delivers high-quality camera performance with 5MP in the front and 13M on the rear enhanced by LG’s intelligent UX features such as Auto Shot and Gesture Shot for selfies. Auto Shot automatically triggers the front camera’s shutter when a face is detected. Gesture Shot takes a selfie in response to a hand signal, eliminating the need to press the shutter button and shaking the phone at the most critical moment. The K4 is equipped with a sensitive 5-inch In-cell Touch display, 5MP front and rear cameras as well as the popular Auto Shot and Gesture Shot features found in the K8. The attractive K4 offers a slim 7.9mm profile and removable 2,500mAh battery as well as a microSD slot for additional storage. The smallest in the series, the K3 comes with a 4.5-inch On-cell Touch display, a 5MP rear camera and a 2MP lens in the front supported by Gesture Shot. With a microSD slot and 2,100mAh removable battery, the K3 offers many features unavailable on other competing smartphones in this category. LG will also debut the third generation Stylus 3, the latest version of its mid-range Stylus smartphone (Stylo in the United States). The Stylus 3 delivers an improved writing experience with a 1.8mm diameter fiber-tip stylus to provide the feel and feedback of an actual pen when writing on the screen. The Stylus 3 also features a fingerprint scanner and enhanced UX with Pen Pop 2.0 as well as the popular Pen Keeper and Screen-off Memo. With Pen Pop 2.0, your memos are never out of sight and can be set to display on the screen whenever the stylus is removed. Pen Keeper displays a warning when the stylus strays too far from the phone, and Screen-off Memo enables note-taking directly on the screen even when the display is off. Information regarding launch dates and markets will be announced locally in the weeks to come. Visitors to CES are encouraged to stop by LG’s stand to see the company’s newest mobile products for themselves (Las Vegas Convention Center, Booth #11100, Central Hall).